Naltrexone Subcutaneous Pellet/Implant-This small ‘pill-sized pellet’ is placed just under the skin in the lower abdomen while the patient is under anesthesia. The Naltrexone implant/pellet releases the opiate blocking medication over a 3-month period. During this time, the Naltrexone implant/pellet completely dissolves and disappears. Daily Oral “pill form” of Naltrexone-Upon discharge, each patient will receive a 12-month prescription to be filled at his or her local pharmacy. Naltrexone is FDA approved as an opiate blocking medication, (not to be confused with Suboxone®/Subutex; Buprenorphine, which are partial opiates). Naltrexone is non-addicting and does not cause withdrawal in any way. 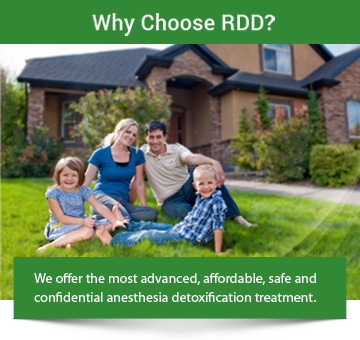 Naltrexone is recommended as part of the RDD Center’s aftercare program for rapid anesthesia detox, as it helps to reduce cravings and temptations and prevents any feeling from an ingested opiate by blocking the uptake of an opiate drug on the opiate receptors. Naltrexone has a very strong binding affinity to the opiate receptors and once the anesthesia detox procedure is complete will ensure continued sobriety as long as you are on Naltrexone. Sustained Release Injectable “IM” Shot-This shot releases medication over a 1 month period and is instead of the daily oral “pill form” of Naltrexone. The Naltrexone injection, or pellet delivery systems are mandatory for Methadone and Suboxone®/Subutex patients due to the long half-life of these drugs. We highly recommend the injection delivery system over the pill form which is given in the O.R. post detox due to patient compliance, comfort and ease of delivery. Only Methadone and Suboxone®/Subutex patients are required to have the 30-day Naltrexone injection or 90-day pellet delivery system due to the extreme length of time Methadone and Suboxone®/Subutex remains in the body fat, liver, etc. The Naltrexone Injection constantly releases the blocking medication for 30 days, unlike a pill that must be taken every day. This will ensure that the residual opiate drugs will not re-attach to the clean opiate receptors which would happen if a patient were to accidentally forget a daily pill. If the patient uses opiates while medicated with Naltrexone, they do not experience the effects of the drug. An opiate cannot attach to the opiate receptors due to Naltrexone occupying the opiate receptors as a blocking agent but it is NOT foolproof when attempting to take very high doses. Naltrexone is not an opiate, is non-addictive, and does not cause withdrawal when stopped. The Naltrexone Pellet/Implant will entirely dissolve and disappear in 3 months. The Naltrexone Injectable will last for 1 month. The pill form of Naltrexone is taken once daily. RDD Center recommends that Naltrexone medication is continued for a full year to ensure long-term sobriety, giving the patient time and the best chance to learn how to live life without opiates. Whichever form of Naltrexone the patient chooses, they are given a prescription for oral Naltrexone for at least 1 year which can be purchased from any local pharmacy. Naltrexone Therapy is a major reason for many of our patient’s continued success. Some of our patients come back every 1 to 2 months for another implant or injection. Patients like the security this provides. Most are amazed at the lack of cravings for opiates while using Naltrexone. An added side benefit our patients may find when taking Naltrexone is that it may reduce the cravings for sweets and high-fat foods such as cookies, chocolate, cake and ice cream. Naltrexone Therapy is only started after a person has been detoxed under anesthesia and ‘clean’ from all opiates. Use of Naltrexone while actively using an opiate or still experiencing withdrawal causes extreme pain and suffering for the patient. New patients wanting just Naltrexone Therapy must detox ‘cold turkey’ on their own and have remained off of all opiates for at least 14-28 days, depending on the specific opiate use. These patients are very few because most cannot endure the suffering of a ‘cold turkey’ detox and find it challenging and difficult to stay ‘clean’ for the required time. WARNING: Patients need to be aware that using opiate drugs with the use of Naltrexone can cause serious health problems and trying to use increased amounts of opiate drugs to “override” the blocking effects of Naltrexone can even cause overdose and death.